ADVT test cards for Visa acquirer device compliance testing (contact). ADVT is a Visa Confirmed Test Tool. 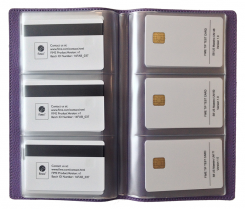 It can be used for Visa certification testing of any type of contact terminal, POS or ATM. The card-terminal transaction logs are simply retrieved using card log software and a PC/SC reader.